Do Cats Need Heartworm Pills? 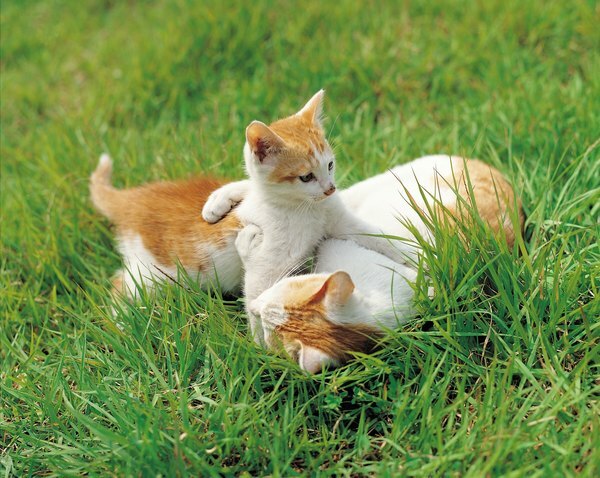 Outdoor cats are at higher risk for heartworms. While heartworms are generally deadlier in dogs, your cat is still at risk, and the parasite could kill her. Cats are equipped with unpredictable levels of immunity to the parasite, so while some prevail, others fall victim to it. As there is no known cure, preventatives are the safest option. Heartworms are transmitted through mosquito bites, so naturally, outdoor cats are at higher risk for contracting the parasite. Mosquitos can still get indoors, though, so even if you have an inside cat, she's still at risk. A single bite from a host mosquito can pump heartworms directly into your cat's body, and once they're in, there is no guaranteed way to rid her of them. While dogs often respond to heartworms by entering cardiac arrest, this symptom is less common in cats. Instead, cats typically show signs of breathing difficulty, like coughing, wheezing and general shortness of breath. Lethargy, anorexia and vomiting either food or foam are other signs, but all of these symptoms are non-specific to heartworms. If your cat demonstrates any or all of these symptoms, she needs to see a vet as soon as possible. Cats are lucky, in that many of them have immune systems heightened to the point where they can kill their own heartworms. This is far from a guarantee, though, and there is no way of predicting whether or not your own cat's immune system is strong enough to do so. If your cat is infested with heartworms and is unable to kill them on her own, she may be crippled to the point of needing hands-on care for the rest of her life, in the form of forced oxygen, IV fluids and regular antibiotics. The simple truth is that while cats can live long, healthy lives without heartworm medication, they are also living in a constant state of risk. A monthly heartworm preventative is all it takes to protect your cat -- think of it as insurance -- and considering that this disease can be fatal if not prevented, administering a heartworm pill could literally save your cat's life. Can Heartworm in Cats Be Contagious?